Post your Trek related questions here! Thread: Post your Trek related questions here! Thanks. How about the Madone SL6? Do you have the weight of the stock wheels on the Domane Sl5 disc? I just installed Sram Red22 eTap on my 2014 Domane P1 without much difficulty. 1. Is there a plug available for the frame where the shift cables used to go in, also for where the FD cable comes up behind the seat tube? 2. I did have a little trouble with the rear brake cable where it enters the frame. I couldn't thread a thin cable casing over the old cable, the hole at the frame is too small. Is there a cable end cap in there, built in or is it something that I should remove? The cable (with cap on it) seems to sit a little loosen, and pops out if I turn the handlebars too far (housing too short?). Last edited by GDTRFB; 1 Week Ago at 05:42 AM. Mitch, what is that part that's sitting on the seat post (green box) and what is it used for? I received one of those with my frame. Btw, here's a photo of the frame. 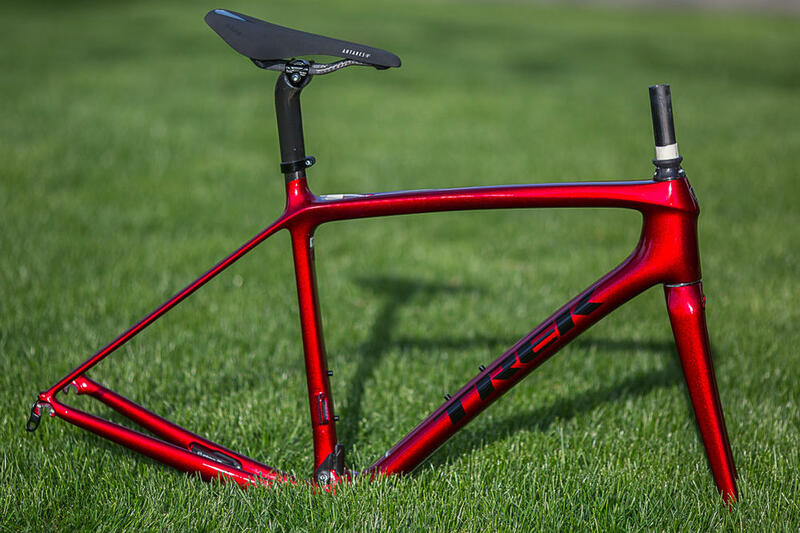 Trek did a beautiful job on the paint. It looks much better in person as these sites tend to compress images, but it gives you an idea. I'm very happy with it. Note: the seat is setup this way to work on my stand, temporarily. I put it on this way so I can use it on my bike stand to work on the bike and didn't change it for the photo shoot. The seat mast is short and the seat mast bolt that secures it to the integrated seat post won't let the stand grip around the seat post (seat mast bolt is in the way). This way I can get a better grip. It works best this way, temporarily that is. I may have to find another work stand for future use as I don't like to secure the bike using the top tube. Last edited by Methodical; 6 Days Ago at 07:02 PM. I'm looking for some guidance here. I have a Domane 2017 SLR7 disc bike that was damaged last October when I was run into a curb by a car last October. There was damage to the seat stay on the right side. I took the bike to my local Trek bike shop and they informed me that this could be repaired. I took their advice and let them repair the damage. Cost of tearing down the bike, shipping, rebuilding the bike and the repair came out to over $950.00. I have only ridden 385 miles on the new frame and on Saturday a crack developed on the left seat stay directly across from where the other repair was made. The bike has not been crashed and I have hardly ridden at all this year due to the rainy winter we had in N CA. 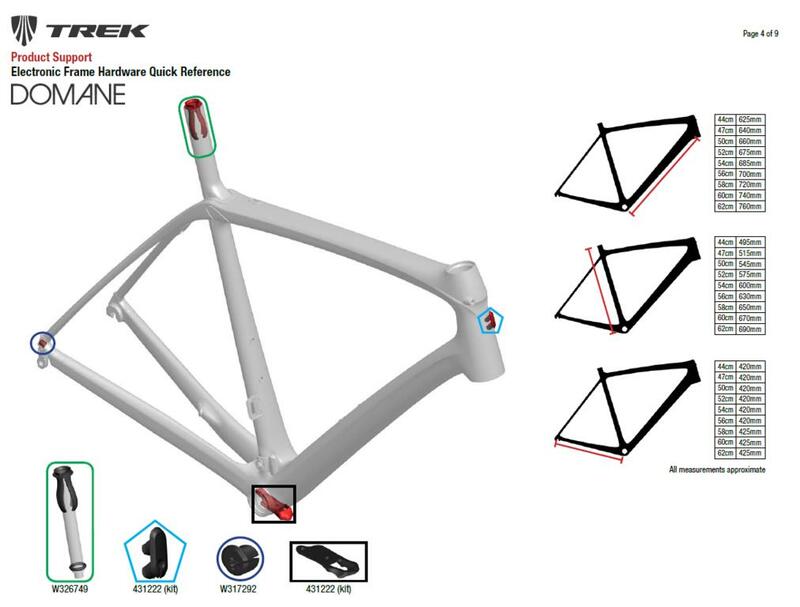 I took it in to the same bike shop and yesterday they informed me that Trek will not stand behind their warranty and I will have to buy a replacement frame or pay for another repair. The shop said they sent a picture to Trek and Trek thinks the bike was crashed. I am at a loss on what to do. I really don't want to spend another $900.00 to fix something that will break again. Would I be better off having all of my components put on an aluminum or steel frame that will hold up better? For what it is worth, I am an average sized man who weighs less than 180 pounds. My weight should not be a factor for the seat stay failure. Does Trek normally cover damage of this type in their warranty? What would you do? Post Your Favorite Cycling Related Apps.